New York is no Texas, Memphis, or Kansas City. The archetypal New York diet places a much higher value on bagels and pizza than tender beef brisket, juicy pork ribs, and dry-rubbed pulled pork. 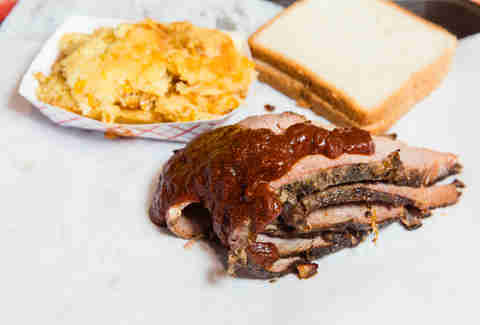 But over the course of the last decade, New York City has become a barbecue town in its own right, with exceptional outlets for different regional barbecue styles all over the city. Since the 1994 opening of classic, now somewhat touristy, Virgil’s in Times Square, the city has exploded with barbecue joints. Virgil’s was followed by Blue Smoke in Flatiron, Dinosaur in Harlem, and Mighty Quinn’s in the East Village -- each of which expanded to Brooklyn after successful turns in Manhattan. 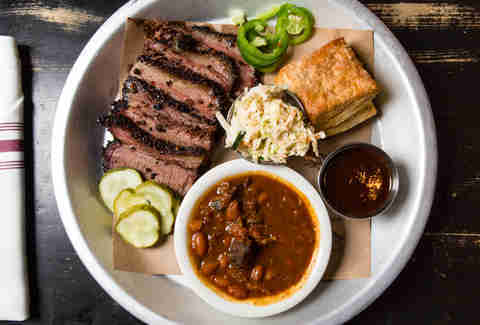 The Brooklyn boom has continued, with a new class of NYC barbecue spots (Fette Sau, Fletcher’s, Hometown) bringing the best of the South to New York, improving upon the classics, and creating an entirely new, unnamed type of barbecue (dare we call it New York-style?). We’ve entered a golden age of Big Apple barbecue. 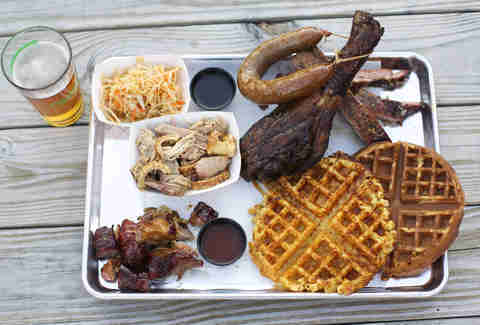 With no-frills joints doing brisket and racks of ribs on brown butcher paper-lined trays, and newer spots with unique craft beer selections and upgraded side dishes (see: mac & cheese waffles), these are the best barbecue spots in New York City. Anybody who’s ever walked along 2nd Ave past 7th and 6th knows the smell: that smoked meat scent that permeates through the walls of Mighty Quinn’s, even in the colder months when the door and windows are kept closed. 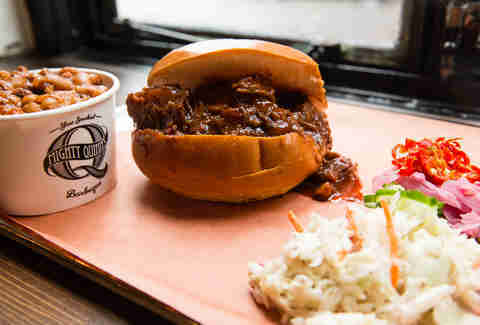 As with many of the city’s top barbecue spots, food is served fast casual-style here (order from behind the counter, collect your trays, and take your seat), but what makes this place, which started out as a stand at Smorgasburg, different from the rest is the authentic smoky flavor, as detectable in each bite of pulled pork, juicy brisket, and fatty brontosaurus rib as the smell is through the building. 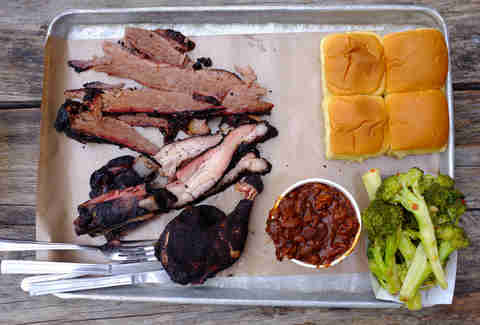 While a lot of barbecue in the city can verge on artificial smoky flavor, Mighty Quinn’s tastes like real barbecue, so much so that the fall-apart tender brisket requires zero sauce -- it’s simply perfect. 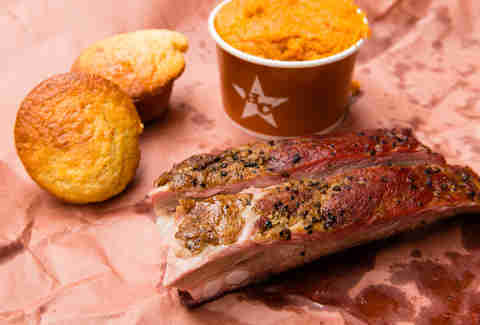 And don’t forget to order a side of burnt end baked beans. You may not want to get the whole goat neck, for a variety of reasons, but you should absolutely get the whole goat neck. Smoke-maven Will Horowitz doesn't do anything resembling standard BBQ at his brick-walled East Village party-box -- which also features impressive cocktails and a nice beer roster that's not trying too hard -- and the curry-heavy neck that falls right off the (rather large) bone is Ducks' most memorable representation of that ethos. 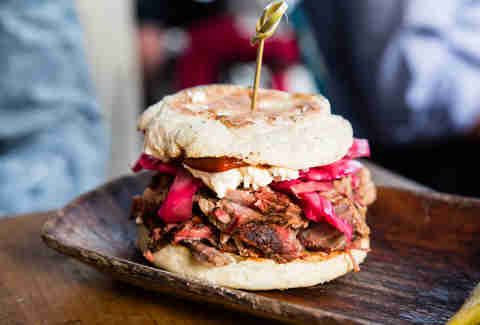 Tuesday nights bring a perfectly fatty brisket sandwich, but even the most traditional of BBQ meats comes piled high with ricotta. Different can be good. In Ducks' case, it's often superb. Mable’s honky tonk charm (think picnic tables and mismatched chairs) is a nod to husband-and-wife owners Jeff Lutonsky and Meghan Love’s respective hometowns (he’s from Oklahoma, she’s from Kentucky), and it’s easy to feel outside of Williamsburg when you’re here. 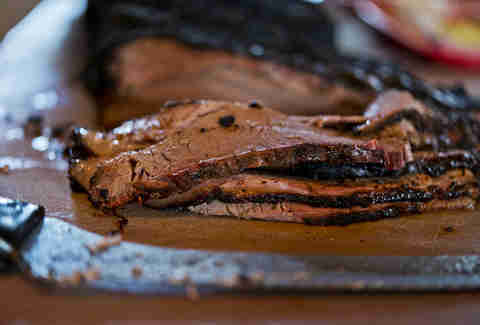 The sliced brisket is hands down the best thing on the menu -- lean with just the right amount of fat, and smoky to the point where sauce is not required (though the tangy but sweet house sauce with vinegar is quite good). But go with a friend because the tender St. Louis-style ribs are also a must, and arrive actually falling off the bone and brushed with just enough house sauce. Order at the counter and take a seat -- your food will arrive before you can even scroll through two posts of your Instagram feed. Although its original Gowanus location is closed for renovations until the fall, you can still munch on Fletcher’s smoky, all-natural, hormone- and antibiotic-free, farm co-op-sourced meats at the DeKalb Market Hall. You won’t get a languid, sit-down experience here, but this is still serious barbecue. Incorporating aspects of different regional styles in a pared-down space, Fletcher’s churns out equally great pulled pork and chopped brisket sandwiches. 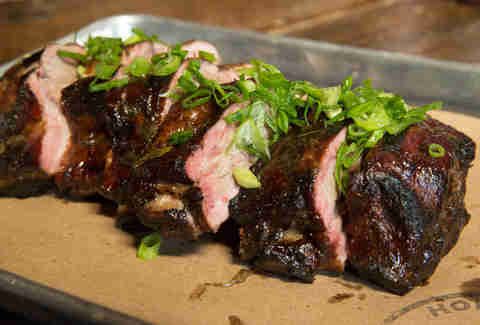 The pork rib tips are a treat, and the dry-rubbed St. Louis pork ribs are a must-try. Be warned: With only this location and another seasonal stand at Riis Park Beach, they sell out fast. Danny Meyer's meat temple might mean more to the art of low-and-slow smoking in New York than any other restaurant: it was the first to firmly position BBQ on a truly grand stage, drove the creation of the BBQ-for-the-people Big Apple Barbecue Block Party, and has always believed that an array of regional styles can Voltron together to create "New York barbecue." Executive chef Jean-Paul Bourgeois, who started smoking there in 2014, has certainly continued down that path -- and while the Battery Park City location especially has turned towards a more pan-Southern-food approach with highlights other than just straight up BBQ and its required traditional sides, if you leave without taking down a half-rack of baby back ribs, it had better only be because they're sold out for the night. 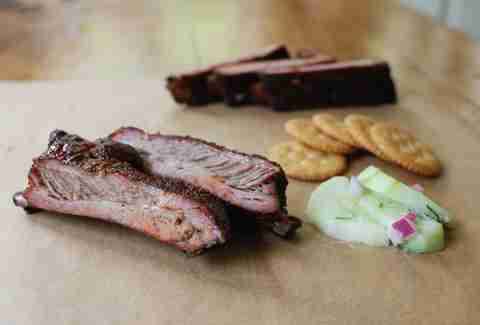 Modeled after the famed Kreuz Market in Lockhart, Texas, which known for its brisket, this Flatiron honky-tonk gets its brisket right, too, by smoking it over post oak from Texas for super fatty and moist results. Kreuz is big on the fact that it doesn’t offer any forks or sauce, and while forks are certainly available at Hill Country, sauce is indeed scarce (found only on the market chicken, which is less memorable than the fantastic brisket). Hill Country is huge, with two floors, lots of tables, different stations where you order your food, and a stage for live music. It certainly resembles Central Texas (at least, as much as a spot in Flatiron can), right down to the brown butcher paper that your meat arrives on. Still one of the most buzzed-about barbecue spots in the city (the original opened in Syracuse in the ‘80s, and there’s another location in Gowanus), John Stage’s joint doesn’t look to one single region for inspiration, instead combining different flavor profiles for tender beef brisket, juicy pork ribs coated in a sweet sauce, and the restaurant's real standout item: spice-rubbed, pit-smoked, char-grilled barbecue chicken wings. There are a number of sauce options to choose from, including an especially fiery sauce aptly called Devil’s Duel, but the garlic Chipotle is always a winner. 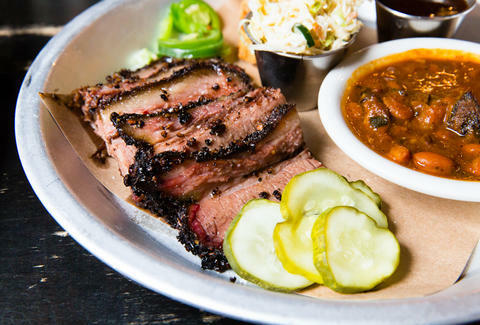 There isn’t a ton of Carolina-style barbecue in New York, and this East Williamsburg/Bushwick spot, which started as a summertime pop-up, is the answer to all your whole hog prayers. Arrogant Swine is very bare bones -- most of the space is taken up by the bar -- and it resembles a beer hall more than a barbecue joint, which was exactly what pitmaster Tyson Ho wanted. Beer plays a big role here (there’s always lots of unique crafts on tap), but the whole hog is what you’re coming for -- pulled pork with just the right balance of sweet and sour flavor. The other specialty here is the Western North Carolina Outside Brown, or pork shoulder, cut into chunks with lots of great smoky taste. The menu also features what is truly the best iteration of barbecue joint mac & cheese in New York: the mac & cheese waffle (yes, that is mac & cheese pressed in a waffle iron). It means “fat pig” in German, and it will do whatever it can to make you the same thing in English. Sporting a run of outdoor picnic tables leading to what’s essentially a cinder block garage filled with hungry Brooklynites who wait in line to select their by-the-pound meats, Fette Sau does everything exceptionally well, and some things exceptionally-er well. The pork ribs will make you feel like a caveman gourmand, an espresso-inflected rub gives the tender pork belly a unique kick, and the charred, fatty top layer of the brisket will melt in your mouth, which is unfortunate -- it’d be better if it just stayed there for, well, ever. Josh Bowen’s ode to his hometown of Kansas City is probably as no-frills as New York barbecue gets. Plastic gingham tablecloths bring a little pizazz to the place’s patio and exposed brick dining room. Ignore the chalkboard menu behind the order counter: the dry-rubbed pulled pork and fatty ribs are great, but you’re here for burnt ends, that Kansas City specialty. 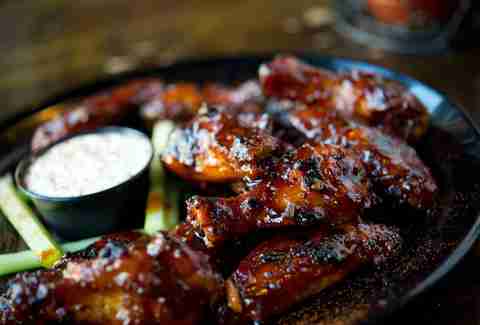 They’re exceptionally smoky and tender, and you could probably eat an entire platter in one sitting. Grab some cornbread and the mac & cheese, too -- perfectly sauced under a nice, crusty top.